After a lifelong obsession with books, Erica Cameron spent her college years getting credit for reading and learning how to make stories of her own. Erica graduated with a double major in psychology and creative writing from Florida State University and began pursuing a career as an author. Erica is many things but most notably the following: writer, reader, editor, asexual, dance fan, choreographer, singer, lover of musical theater, movie obsessed, sucker for romance, Florida resident, and quasi-recluse. She loves the beach but hates the heat, has equal passion for the art of Salvador Dali and Venetian Carnival masks, has a penchant for unique jewelry and sun/moon décor pieces, and a desire to travel the entire world on a cruise ship. Or a private yacht. You know, whatever works. Her debut novel, Sing Sweet Nightingale, released March 2014 and it was the first volume of The Dream War Saga. In May 2015, Erica and her co-author Lani Woodland launched the Laguna Tides series with Taken by Chance. Riptide’s new YA imprint Triton Books will release both books in the Assassins series, Discord and Nemesis, in 2016. 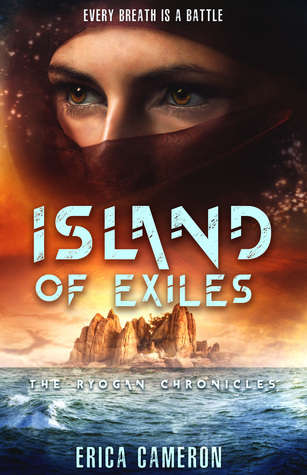 The Ryogan Chronicles, a fantasy trilogy set to launch through Entangled Teen, will launch in 2017 with Island of Exiles. I breathe the briny air and try to consider the options objectively. As objectively as I ever can when my brother is involved. Yorri was the first person to tell me that one day I’d be kaigo, just like our blood-parents, serving the Miriseh and earning high honors in Ryogo. I’d flicked him on the shoulder and said “Of course I will be,” but his faith had been what convinced me I was right. Yorri gets so excited he stumbles over his own words when he’s explaining how he solved some new, impossible puzzle. He devotes himself with frightening fervor to anything that ensnares his arrow-quick mind, but sometimes needs reminding that the rest of the world exists. Forget objectivity. It’s worth the risk. I am going to keep him safe, just like I always have. “You’re going to be late for the vigil if you stand here staring into nothing for much longer, Khya.” I tense, keeping my eyes on the angry, dark, blue white-capped waves. I’d heard the footsteps approaching, but several people had come and gone already and left me alone. Tessen, however, never was able to keep his thoughts inside his head. “I won’t be late.” I answer without looking at him until he moves into my peripheral vision. He leans against the wall to the left of me, his forearms crossed on the ledge and his head tilted up. With his arms folded on the ledge and his body held slightly away from the wall, I can make out the lines of muscle under layers of cloth, all of it hard-earned—though I probably won’t ever admit that to him. I don’t look directly at him, but I turn my head enough to get a better look at his face. He’s taller than me, so looking down on him like this is strange. Seeing him without the hood and atakafu we always wear on duty is stranger. I don’t think I’ve seen his whole face since he became nyshin over a year ago. His thick eyebrows sit low over his deep-set eyes and the line of his nose is straight, because somehow he was always quick enough in training to avoid all but the most glancing blows to his face. The setting sun highlights the red in his terra-cotta skin and makes his oddly pale eyes flash. Usually they’re limestone gray, but now they’re paler than ever and gleaming almost as bright as the sunlight off the ocean. “Shouldn’t you be off training? Or guarding something?” I ask before he speaks. “I am.” He smirks at me. “I’m guarding the mad nyshin girl who’s decided to perch on the walls and imitate a mykyn bird.” “I’m not planning on attempting flight.” I wave my hand at him, trying to brush him off. “You can go, Nyshin-ten.” His lips purse; I hide a smile. It was delightful discovering exactly how annoyed he got when I called him by his class and rank instead of his name. The flash of aggravation disappears quickly, replaced by his more usual sardonic smile. “Should I guess what has you lost in your own head the night of a vigil?” “No. I don’t have that much time.” “Then I won’t guess. Only your brother puts that look on your face.” I look at him, expecting to see mockery in his eyes. There isn’t any. He looks almost…serious? “You’re worried about his herynshi. Unless he’s in trouble again? It’s been a while. He’s overdue.” “It’s been a while because he doesn’t have to deal with people who point out his every mistake anymore. Like you.” Gritting my teeth, I bend to brace my hand on the ledge and jump down to where Tessen stands. At six feet, he’s only an inch or two taller than me. Our eyes are nearly level when I square off against him. “You’re one of the reasons he ever got in trouble in the first place.” “And you spent years trying to make him invisible.” Tessen’s lips thin, and the muscles in his jaw clench for a moment. “Even before you found your wards, you shielded him from everything. What he can do now that you’re not there to monitor his every move should be all the proof you need.” “He would have died if I hadn’t protected him.” Nothing will ever convince me it was wrong to keep him alive. “You can’t seriously be suggesting I should have let that happen?” “No, that isn’t— You don’t even know what he’s capable of! How long has it been since you’ve seen him fight? It’s been—” He steps back, his lips pressed tight and his hands held away from his weapons. “Bellows, Khya. I didn’t come here to fight with you. This isn’t how this was supposed to go.” I blink. “What?” Tessen backing away from an argument? This has to be a trick. “How what was supposed to go?” He shakes his head, a small smile quirking up the corners of his mouth. “I only came to ask if you’d dance with me tonight at the celebration.” He can’t be serious…but there’s not a single sign that he isn’t being sincere. I drop my gaze to hide the confusion that has to show on my face. My focus catches on the pendant gleaming against the undyed cloth of his tunic—a two-inch iron disc etched with crossed zeeka swords. Blood and rot, I hate seeing that around his neck. The zeeka is the symbol of the kaigo; the pendant is a symbol of their students. Tessen is wearing the kaigo-sei pendant that should have been mine. Out of the whole clan, the Miriseh and the kaigo only choose one nyshin-ten per year. His blood-mother, Neeva, is on the kaigo council. Being named a kaigo-sei isn’t a guarantee of advancement, but it is a sign that the leaders of the clan are keeping an eye on you. The kaigo-sei are given extra training and have to face additional tests of magic, skill, and leadership. Not every nyshin named a kaigo-sei student becomes a council member, but no one who isn’t a kaigo-sei will ever become one. I can still earn one—and I will, sooner rather than later—but it seems like they’re already grooming Tessen to take Kaigo Neeva’s place one day. Rot take him, it was supposed to be me. Swallowing the fruitless envy building in my chest, I raise my eyes to meet Tessen’s again. “I don’t make promises I don’t intend to keep.” “But that’s not a no, so I’ll ask again tonight.” He smiles, inclines his head, and then walks away whistling. I hate that sound, and I’m almost positive he knows that.